Pretty much as standard TS808 with slight modification and switchable clipping diodes. We've seen it all a thousand times but here it is in case anyone would like to build one. This OD has so much tone it is unbelievable. The harmonics and note clarity just drip out of it. This is the best sounding OD that I have ever built. I would put this up against any OD at any price built by anyone. It took me along time to get this pedal where it is. I had a tone in my head and I have finally got it. This has a 3 way toggle switch that allows different clipping and gain structures. The Signa Drive can go from a clean boost all the way to a Marshall crunch and every thing in between. If you are looking for a very versatile OD this is it. I am very proud of this pedal. This pedal is so good, it most likely will replace both the Tubeslammer and the Tubeslammer Deluxe! Thanks for this one! I'm stoked to try it out...but i suppose i should wait for my zendrive parts to arrive first...so it goes. Sort of. It's an exact layout match to the TS808, TS9 and Landgraff Dynamic Overdrive, all of which have been verified. 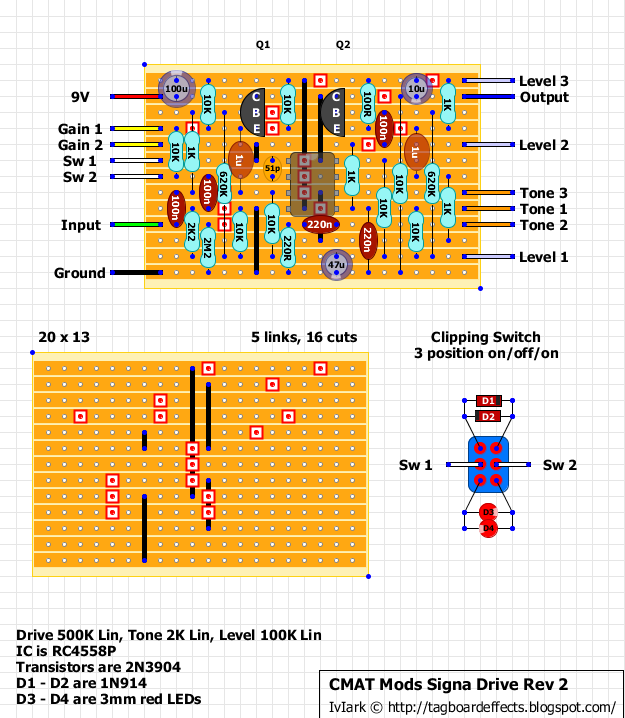 So although I'm not aware of anyone specifically building this yet, I'm confident that the layout is correct. Using a 50pf instead of a 51pf ceramic cap shouldn't affect anything noticeably, right? Finished, sounds great, but level pot has virtually no effect...only noticeable on last 10% or so. Perhaps a bad pot or something else? For some strange reason, the Signa Drive uses a linear pot for the level, while most TS-style pedals use log-taper. If you have a 100kA pot, give that a shot. It sounds like you are using a log pot. A linear pot isn't tapered so level should be equal to rotation, eg, a pot has 240 degrees of rotation, turn a linear pot half way and you have 50 percent volume, to get the same volume from a log pot requires turning 200 degrees and the other half of the volume is in the remaining 40 degrees. Sunshine must have had some error on his build, as this went smooth as usual with me. Had zero expectations, as i've built ~5 screamers and derivatives. No of these impress too much. But i really must admit.. This is, in my opinion, one of the best modded TS-circuits i've played with. It's nothing super awesome, but still really nice OD. Somehow i feel that i'm getting more volume out of this than any of my other builds. Plus the short, yet effective range of the modded tone stack works really well. I used the basic comps, such as 2N3904s (hFE=278 for Q1 and hFE=312 for Q2) and JRC4558D (i need to get more of these as i'm running low:)). And yes. You've guessed it - I made the clipping static by just soldering two 3mm bright, clear water green LEDs back to back between rows 4 & 5, just below Q1. Like many other circuits against my ever defining taste, this is nice, not shocking but nice. On the negative side, this, like many other Ibanez/Maxon ODs, eat out some of the low end. Not nearly as much as that Soft OD/Dist, but still there are some distinct frequencies just missing. Ha ha, awesome thanks matey! Any reason why I wouldn't be able to use a 5mm LED on the switch? I broke a lead off my last 3 mm. Grrr. No, use whatever you have. 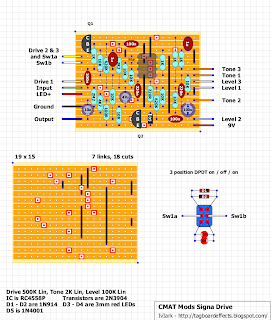 I'll mention size if it's specified on the schematic but it's the forward voltage that's important not the dimensions. Any red LED should be in the same ballpark, and from the same manufacturer I'd expect a 3mm and a 5mm (of the same colour) to measure as closely as two of one size. I might be being really silly here, but I can't see where the on/bypass switch should connect in and how to wire it? Oh! - thanks. I hadn't noticed those pages!! So do clones generally always get built with true bypass, even if the originals aren't? The vast majority do. There are 4 or 5 layouts on here that use buffered bypass, but the vast majority are done with true mechanical bypass in mind. 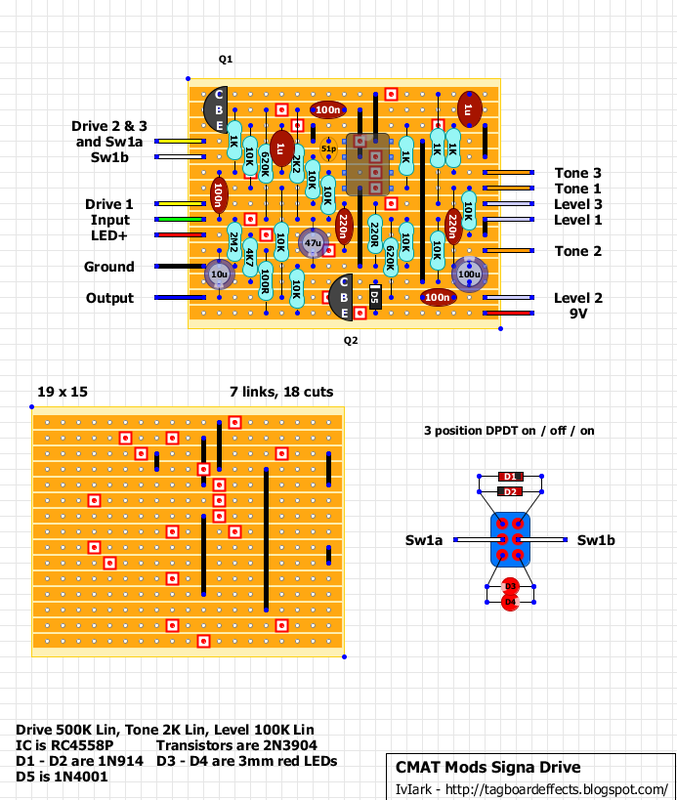 I don't think too many people will want to build a Boss pedal with the extra 4 or so transistors or fets that are used for the bypass and if they do then vero isn't the right medium to be using because the bypass circuit alone will take up a lot of room on the boards. I am definitely a fan of buffers but I'd much prefer to just use the buffer of my own choice at the beginning of the chain, and then true bypass thereafter rather than have multiple buffers always on in series in the chain. Interesting! - so what you're saying is that multiple buffers throughout the chain is actually a negative and one at the beginning is actually better? Well when you have a buffer, the signal out is very low impedance which is enough to drive and extremely long chain without any signal degradation. I much prefer the idea of including a buffer of choice where I want rather than have them always in circuit throughout the chain because that is the nature of the bypass used by the individual effects. Mine works and sounds very good, but the noise level is slightly higher than other OD pedals. ive got a really strong explotion when pushing on\bypass any suggestions? please help! i cant find any ceramic or mylar caps with 1uF... can I use the electrolytic ones but how about the polarity? Yes. Just make shure the signal flows in trough the pluss side of the cap and out the minus side. In cases like these I normaly put the cap in a socket so that it can be substituted with a correct one when I restock my caps. As far as I have learned, you should avoid electrolytics unless they are absolutly requiered. But yes, it should make the circuit work. how did you guys find out about the IC chip orientation? If you look closely at the chip, you'll see a slightly lighter colored half circle (sometimes it's a dot, slightly to the left) that indicates the top op the chip. do you by any chance know how to connect the switch too? the diodes and the LED's... do i just bridge the two pins on the switch with them? they don't go through the circuit board? On the pots, do the leads go 1, 2, 3 or 3, 2, 1 when looking at it from the bottom when screwed in?? do you have the schematic for this one? cant find the schematics for camt mods signa drive? Thanks, did some deeper searching, found some on tayda too...have you built this one? too late, already ordered the parts for this one.. Its my first build.. Didnt look too complex.. I went with all metal film resistors as well, and ordered some different op amps to try too.. I'll look up the landgraff.. If I have any problems when I start this build you mind if I hit you up for questions? Look at the layout quickly, if you've got the parts for this then you've got 95% of the parts for the Landgraff anyway. The only difference is a few resistors and one or two caps. Ok So I just built this, and im getting hardly any gain out of it.. Gain pot doesnt do much, rolls off highs when turned down... any ideas?? Q1 9.1v 3.3v 2.8v --- Q2 9.1v 3.3v 2.8v..... IC 4.5, 4.6, 4.5, 0, 9.1, 8.5, 4.5, 4.5.. Think I got it fixed. Placed a .47u instead of a 47u elec cap. doesnt have a lot of gain on diode clipping, tons of output on no diodes selected, and led's have low output.. All sound normal? Any way to increase the output on the led clipping side and get a little more gain out of the diode side? Something is still not quite right if you're getting 8.5V on pin 7. Look closely between pins 7 and 8 and see if there is an unwanted bridge being made anywhere. If there is anything there creating an intermittent short that could account for the higher voltage than expected. Whether or not thats correct or not im not sure. So according to I have it, that would be 8.5 on pin 6, not 7, and 4.5 on pins 7 and 8.
ok on pin 7 im now getting 5v. I didnt realize the 1uf caps I had in there were polarized (tantalum's) and switched them out for 1uf box style. Does this sound correct now? would it make a difference that I switched the 620k for a 680k?? What else should I check? Ok, made an observation today while checking for solder bridges, which I didnt find any. Pin 7 read at 5.2v, but if I touch the enclosure, it spikes to 8.5v. Is that normal? In the new layout, what happens with Gain 3? Is it still joined to Gain 2? You could join it to 2 if you want, but when only 2 lugs are mentioned the pot is being used as a simple variable resistor and only 2 lugs are required. At least I get this thing in one box. There is SHO added with switch, pre or post boost.